The newest advances in smart clothing and wearable technology include such things as Bluetooth bras that detect early signs of breast cancer and jewelry designed to measure UV exposure. NEW YORK (MainStreet) — In the rapidly evolving world of smart clothing and wearable technology, it can sometimes be hard to keep up with the latest developments. For instance, as cool and advanced as they are, the Fitbit and smart watches are practically beginning to feel outdated among the latest crop of emerging offerings. The newest advances in the field (some so new they're not yet available for sale) include such things as Bluetooth bras that detect early signs of breast cancer, hairclips and jewelry designed to help you measure UV exposure and possibly avoid skin cancer and smart socks aimed at improving running performance and providing real time feedback, thus minimizing injuries. It's an exciting time, according to industry insiders, with new advances and announcements becoming almost commonplace. Companies of all sizes - start-ups, well-known brands and industry giants - are all part of the mix, working on intriguing projects to shape the future and impact how consumers interact with technology, as well as how we monitor various aspects of our health. "I think it's the most exciting time for smart clothing that's being applied to the medical industry," says Luis Rincon, co-founder and CEO of Wearables.com, a site launched last year to cover this dynamic industry and sell some of the latest products. Because he spends his days working at a media and commerce hub focused on the wearable technology and smart clothing industry, Rincon is among those with a cutting edge view of all the new and emerging products, news and developments. Wearbles.com receives numerous press releases each day. Rincon rattles off so many intriguing tidbits - nanoparticles designed to detect cancer when swallowed by the consumer, smart hospital gowns and patient-centric smart watches - it can sometimes be fascinatingly dizzying. Meanwhile for expectant moms, a promising young Cornell University senior has created a concept for a maternity clothing line that monitors a woman's health via conductive silver fibers embedded in the fabric, tracking such things as the mother's blood pressure, body temperature and respiration levels. The information is transmitted to an iPhone app where it can be reviewed. Yet another exciting innovation is a wearable device designed to help kick the smoking habit by delivering nicotine replacement and also bits of encouragement throughout the day. The device, from Chrono Therapeutics, was developed to give varying levels of nicotine based on the user's craving cycles. It also has a Bluetooth to connect to a Smartphone app. If approved by the Federal Trade Commission, it will be released to the public in 2017. "We're just at the beginning of what's going to happen with wearables," says Ruth Thompson, head of consumer product development for Cambridge Consultants. "There's been quite a lot of general tracking and monitoring systems...Pedometers are so passé now. It's getting far more event specific or sport specific as the industry gets more confident in trying these things out." Cambridge Consultants recently unveiled its own innovation in this space - a tiny hair clip called a Solitair designed to gauge the wearer's sun exposure. The Solitair clip combines information about the user's sun exposure with data about the individual's skin type and schedule for the day to provide real-time recommendations about when it's time to cover up or move indoors. It was developed as a "thought piece," says Thompson, and is not available to the general public. If an investor comes forward who wants to bring the product to market however, than the product may be made available. "We wanted to do an interesting piece about sun care for people not only worried about skin cancer, but also for people who are worried about not getting enough sun," she says. For those intrigued by the idea, a company called Netatmo has developed a funky piece of wrist jewelry called June that measures your exposure and notifies you when its time to put on sun protection. The company says its $129 piece of jewelry and associated technology will help users discover how to avoid damage and prevent premature skin aging. And it comes in various stylish colors. Thompson says many of these types of developments are made possible thanks to advances in technology tied to the shrinking size of components, their improved performance, increasingly powerful algorithms and reduced price. Still, among the most intriguing entrants is Cyrcadia's iTBra, a wearable technology that provides monthly breast wellness screening. The bra has been successfully tested on more than 500 patients, according to the company website, and demonstrated an 87% correlation to a verified, clinical diagnosis of breast cancer. Wearing the iTBra, which has embedded technology, for 12 hours provides what the company calls a highly accurate monthly self-breast exam. The bra contains intelligent breast patches that detect tiny circadian temperature changes within breast cells and using a smart phone enabled device, communicates such information to the Cyrcadia Health laboratory. The bra involves use of big-data predictive analytic software, a series of algorithms and neural networks to identify and categorize abnormal temperature and other cellular signaling patterns and behavior in otherwise healthy breast tissue. Google's work on nanoparticles is also difficult to not be excited about. The Wall Street Journal initially broke this news, reporting that Google is developing tiny magnetic particles that literally patrol the human body for signs of cancer and work in conjunction with a corresponding wrist-based wearable. The challenge that comes with such revolutionary advancements in smart clothing that's used in conjunction with health treatment or diagnosis, however, is that the products are required to go through extensive and expensive testing and trials, says Rincon. So in the meantime, the vast majority of the new health related smart clothing and wearable technology is being designed with a more general focus, aimed at the fitness market. The Sensoria Fitness sock is one of the leading examples. 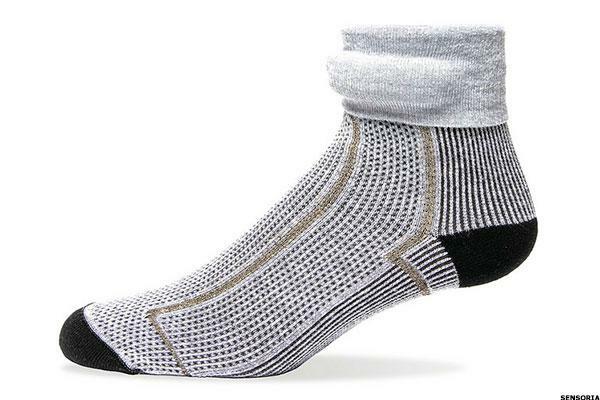 Designed to function as a textile circuit board, the sock is infused with three sensors under the bottom of the foot to detect pressure. Conductive fibers relay the data collected by the sensors to an anklet. The socks are paired with a Smartphone app that includes a virtual coach who continuously monitors the user's running form and provides real-time feedback through audio and video cues during the run. Ultimately, the goal is to improve the wearer's speed, pace and cadence, and avoid injuries, among other things. Sensoria, Inc. the Washington-based start-up that developed the sock, is a prime example of the many small innovators who are making great strides in the industry right now. Led by Davide Vigano, a former Microsoft executive, and two partners, the company is merely at the start of its development journey in this arena. Sensoria Inc. has about 50 developers working on various new ideas and projects at the moment, says Vigano. "Our goal is to make the electronics completely disappear to the human eye. That is the goal and we are working on it," he says, revealing just one of the company's many initiatives. Vigano also talks of leveraging Sensoria's sports bra to detect cancer, similar to Cyrcadia's iTBra. His excitement about this field is infectious, as is his optimism about what the future holds when it comes to smart clothing and wearable devices, particularly those designed to assist with the user's health in some way. "We actually think a very large number of medical devices will be replaced by smart garments," he says. "Garments will either replace medical devices or augment them." To which he adds: "The sky is the limit."